Speaking honestly, Veterans Day doesn’t rank very high on the list of holidays for most Americans. Of the patriotic holidays, Memorial Day marks the beginning of summer, the 4th of July is the nation’s birthday party (plus it has fireworks!) and Thanksgiving has food, family and football. Even Labor Day–and three day weekend it brings–probably gets more national love. Some of that probably has to do with the holiday being held in concert with Armistice Day or Remembrance Day around the world to mark the end of World War I (the “11th hour of the 11th day of the 11th month…”), and event that scared Europe and others parts of the world far more than the United States. But if you’ve visited this space before you know that all of our thinking here at KETC has been changed in the last year because of our involvement in collecting the St. Louis story of World War II as part of the Your Stories project. One of the major efforts of this project was the collecting and presenting of the names of the nearly 5,000 men and women from the St. Louis area who lost their lives in service to their country during the war. We will once again broadcast those names in the program In Honor of St. Louis’ Fallen 1941-45 this Sunday, November 11, at 1:30 p.m. You can see a listing of the names online as well on our Your Stories site. As for me, I’ll spend this Veterans Day thinking about what it means for anyone at anytime to provide service in defense of our country. And I’ll make a promise to myself to not forget about Veterans Day ever again. So in case you hadn’t heard: we aren’t done yet. We still want you to share your stories with us. And once again, I have to say a big thanks to our interns who have kept this project going. They’ve made it possible for Your Stories to become success it has. So thanks once again. We can’t say it enough. Well, tonight brings to a close the first run of Ken Burns’ The War (although if you missed any of it the entire series will replay on consecutive Wednesday starting tomorrow at 9:00 p.m.). Tonight he will focus in part on what it was like for the millions of men who went off to war to return home and try and live a “normal” life. So as the series returns home, it has put me in a reflective mood as to where the journey has taken me. I will admit that I have found it difficult to watch at times. As silly as it sounds, I’ve found myself feeling emotionally drained just from watching. I think the series has definitely told the human stories of what Burns’ has called “the worst war” in a way that will change how many people feel about not just this war, but all wars. For us here at KETC, the stories and memories you have shared with us has definitely changed how we feel about World War II. It is tempting to try and order history by dates, lines on maps, and numbers of killed, wounded, missing. But history is much more than that. And while that’s easy to say, your stories have made it something that for us will be impossible to forget. Thank you again for all your contributions. Well, after all our waiting, Ken Burns’ The War premiered last night on KETC and PBS stations across the nation. We had high viewership here in the St. Louis area, and I’d imagine that was the case across the country. Hopefully you were able to tune in, but if not I’d highly suggest you try and watch this evening at 7:00 p.m. for the second episode. I won’t give you a long review here. I hope you’ll form your own conclusions. But at the risk of being politically incorrect, one thing I took away from last night’s episode was that the men who fought World War II were tough SOBs, and I mean that most complementary way imaginable. Wow. It’s hard for me to believe that the debut of Ken Burns new film, THE WAR, is actually here. THE WAR debuts nationwide on Sunday, September 23. At Channel 9, we’ve been planning and doing this work around WWII for many, many months. We’ve all been profoundly moved by the conversations we’re having with the community–it’s as if the Channel 9 family has grown much larger as a result of sharing these stories of WWII. One of our proudest efforts has been to document the names of all the service men and women from our region who died in service to their country during WWII. This list includes the names from all branches of the military including the Coast Guard and Merchant Marine. This list has never been before compiled from our region. It is hugely powerful to see these 4,889 names and realize all of these brave individuals were just that–individuals with families and hopes and dreams. Channel 9 has created a living memorial to these individuals with In Honor of St. Louis Fallen: 1941-1945, a one hour production that will air on Saturday, September 22 at 8:30 pm. This memorial also includes local images and audio interviews that we’ve collected through Your Stories: St. Louis Remembers World War II. I think it’s going to be very moving and I hope that you’re as moved as all of us are by these stories. I don’t know why, but I’m a retro image nut. I’ve got retro/vintage advertising art in my den at home, and I’m trying to get some really unique retro art framed and on my office walls (which are still bare, but that’s another story…). 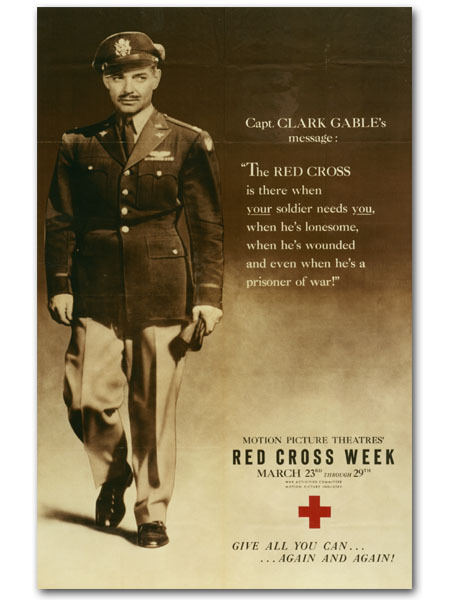 So when the local Red Cross chapter offered us a collection of World War II era Red Cross posters, I knew we had to find a place for them on our Your Stories site. Of course, for me these posters are a window to that era. At the time, they were a vital part of keeping the population engaged in the war effort. They were a form of art (some would say a lost art) that needed to not only provide information, but also to inspire. I could go on, but I really ought to let them speak for themselves. Click Clark Gable below to see more. Enjoy. 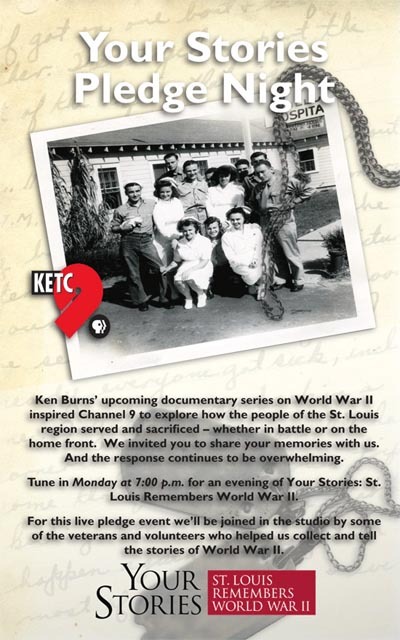 As I think more than a few people have said, if you’ve watch KETC at all during the last couple of months, you’re probably aware that we have been telling the World War II stories of St. Louis. Last night we tried to pull it all together with a broadcast of a compilation of Your Stories, as well as having some of the people we’ve met along the way live in our studio. If you missed it—or if you want to see it again—we will re-air the program tomorrow (September 12) at 7:00 p.m.
We’ve also tired to pull the stories together in two sets of DVDs. Here’s more information on how you can own them for yourself. We are very proud of the work we’ve done on this project, and hope you’ll not only want to have these DVDs for your collection, but also as a way to show your support for what we’ve done and are continuing to do for our community. In just a couple of weeks, America will be talking about WWII when The War debuts on PBS stations across the country. But here in St. Louis, we’ve been hearing, recording, telling and showing stories for months, and what we’ve learned has moved us in ways I don’t think we imagined when we began. So allow us a moment—but just a moment—to look back and smile on the work done. Thanks. This coming Monday night is shaping up to be an exciting night for us, and we hope for you. Starting at 7:00 p.m. right here on KETC/Channel 9, we are going broadcast a special program that will serve as a summary—if you will—of our Your Stories project by featuring many of the stories you’ve seen on Living St. Louis as well as some of the other pieces we’ve created (or are creating) for the project. It should be a moving night of television. Full disclosure: the program is a pledge program, and we are going to be asking for your support to help us with this project and future projects like it. But we hope the night will show you the sort of impact the project has had, and continues to have. I’m going to try and post a promo as soon as I can get it, and hopefully that will give you more a feel for what we are doing. But please tune in Monday if you can. I don’t think you’ll be disappointed. The other day I got a phone call from a nice woman who had read about our Your Stories project. She wanted to see if we knew about a piece of local World War II history–the 1943 glider crash at Lambert Field. We do. In fact, Channel 9 had done a story about it some years ago. The crash was one of the biggest disasters in St. Louis aviation history–10 people including the mayor of St. Louis and other city officials died when a troop transport glider fell apart during a demonstration flight. I asked the woman why she was checking about this particular bit of history. Well, it turns out that she witnessed the crash! I was stunned. She had been the first female radio operator (for TWA, I think, although in my surprise I didn’t catch all the details) and worked at Lambert Field. She must have been working in the tower, because she could look down on the crowd watching the demonstration. Her attention was grabbed by the sound of a spontaneous, horrified exclamation from the onlookers. She looked out and saw various pieces of the glider detach and fall to the earth. She dashed out of her office just in time to catch a woman fainting in the hallway. It turned out to be the wife of the mayor; the poor woman had just watched her husband die. I told the lady on the phone to please write down her story, or let us videotape her recollection. She demurred. I think the prospect of going public was alarming. “I’m 87!” she protested. And with that she conveyed the idea that she was too old, too tired and too overwhelmed with daily tasks to face dealing with anything more. She made her phone call; that was enough. My own mother is 85, so I understand where this woman is coming from. But her story illustrates how important it is to record these memories of history before they are lost forever. If you know of someone with a story to tell, please help them tell it! You don’t have to be Ken Burns or Gore Vidal. We welcome all submissions in any form–write it, type it, video tape it, audio tape it. If you’re reading this now, you can do it!